Rev. Dox is a graduate of Sterling College, in Sterling, Kansas and received her Master's Degree from Princeton Theological Seminary, Princeton, New Jersey. She has served as the Director of Christian Education at the Oradell Reformed Church of America in Oradell, NJ. and at the New Providence Presbyterian Church in New Providence NJ. 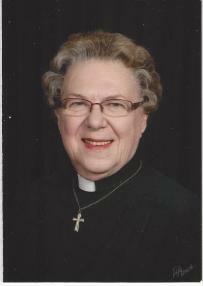 She was pastor at the First Congregational Church UCC in Norwood, NY for seven years prior to being called to serve the First Congregational Church of Antwerp United Church of Christ. She has been the pastor there for the past seven years.